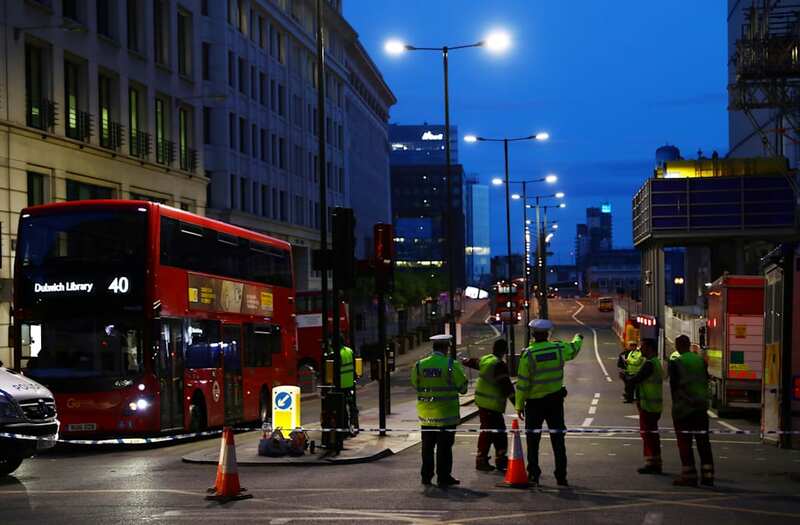 LONDON — The Islamic State has claimed responsibility for the string of terrorist attacks at London Bridge and Borough Market Saturday evening. According to a statement posted to its "Amaq" propaganda outlet, ISIS said a "detachment" of its fighters had carried out the attacks which left seven dead and dozens injured. Authorities have not yet released the names of the three attackers, all of whom were fatally shot. Police conducted multiple raids in East Ham Sunday morning as part of their ongoing investigation into the attacks, and 12 people were arrested. One of those raids was on a block of flats in Barking, London. The East London neighborhood is home to many Muslims and it is common to see women wearing the burka there. During the Barking Road raid, police reportedly warned a suspect running across a roof to "get back or we'll shoot." Video footage also shows armed officers pointing their weapons towards the roof and shouting, "Stand up, show us your hands" at the suspect. Locals told Sky that they recognized a neighbor as the suspect who had been killed by police last night. One suspect, seen in the image above, wore a close-cropped beard and wore an Arsenal away football shirt. Metropolitan Police Assistant Mark Rowley said on Sunday during a press conference that eight police officers exchanged gunfire with the assailants as the attacks unfolded. Rowley told reporters that officers fired an "unprecedented" 50 bullets in response to the attacks, eventually killing the three attackers. A member of the public was also shot as police fired on the attackers. The whole incident lasted about eight minutes. "I'm moving house at the moment. So I had a big van outside. He came up to me and said 'oh Ken, you're moving'. He's usually a very nice friendly guy. But this time it was on a different level of nice. It's quite strange to put into words. He was asking me where I was moving to etc and then he started asking about the van. Where did you get your van Ken? How much is it? Is it possible to get it in automatic? All these specific questions about the van, which obviously now makes sense in my head. At the time, I didn't think anything of it." Furqan Navi, who lived in the block raided by police in Barking this morning, said he recognized his neighbor as one of the attackers lying dead in Borough Market after he had been shot by armed police. "He lived there with his wife and two children, he'd been there for about three years. He seemed pretty friendly but I didn't know him," Navi said. Another neighbor said he had seen the man two days ago. "He seemed a friendly, cool sort of guy. He was friendly and liked playing with kids. He was in his 20s I guess." Seva Litvjakovs, a neighbor, said the man was called Mohammed, known locally as Abs. "I spoke with him yesterday, about 5pm," he said. "He seemed to be tidying up his car, taking stuff out. He was with two other guys. He was wearing his Arsenal shirt. I just said 'hi' and asked if he was OK. He said everything was fine. He had a British accent. His beard was longer, bushier [than in a photo he was shown]. Salahudee Jayabdeen, 40, said one of the suspected attackers had been forcibly removed from a local mosque called Jabir Bin Zyad after questioning the Imam during a service. He said he had seen the man in the area for the past year. "It was about two months ago and he started questioning what the imam was saying. I can't remember exactly what it was about but was asked to leave. He didn't want to and was forcibly taken out." The London Bridge and Borough Market terror attacks came days before national elections are set to take place in the UK, and shortly after the British government downgraded the threat level from "critical" to "severe." Prime Minister May had declared a "critical" threat level following last month's attacks at Manchester Arena, where a suicide bomber carried out an attack following an Ariana Grande concert. On Sunday, May's Conservative Party and the left-wing Labour Party announced they temporarily would stop campaigning for parliamentary elections out of respect for the victims. The far-right UK Independence Party said it would continue campaigning as planned. May said the election would take place on Thursday as scheduled. Here is the Metropolitan Police's statement on the London Bridge and Borough Market arrests this morning.